UNINHABITED COMBAT AERIAL VEHICLES - Panacea or Pipe Dream? 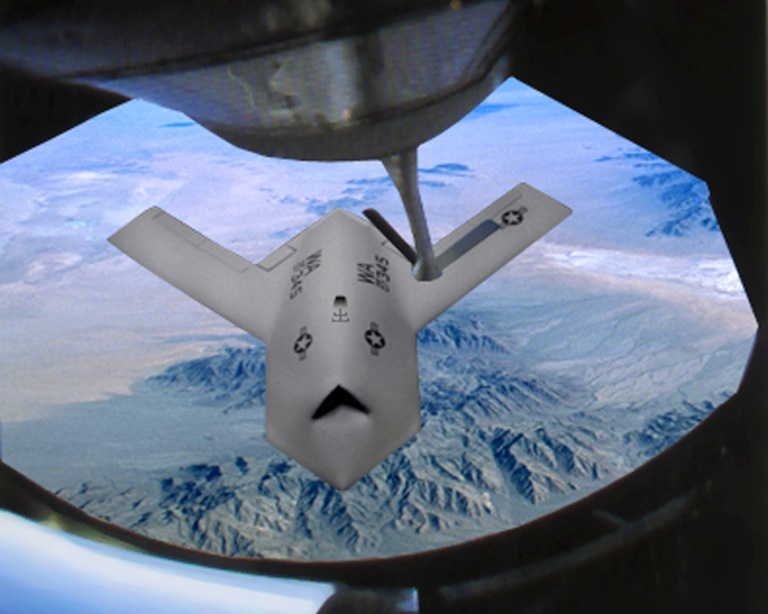 Uninhabited Combat Aerial Vehicles, more commonly referred to as UCAVs, have become somewhat of a cult item in some circles. Often described as the ultimate replacement for manned combat aircraft, UCAVs appear to have developed some very vocal advocates, especially in Canberra. In the broadest sense UCAVs represent little more than evolutionary technological growth of established Remotely Piloted Vehicle (RPV) and Uninhabited Aerial Vehicle (UAV) technologies. Unlike established technology, a modern UCAV is designed from the outset for a combat role, delivering a range of precision guided munitions. From a historical perspective, the idea of an unpiloted aircraft delivering weapons is nothing new. The US Air Force conducted extensive trials during the latter years of the Vietnam conflict involving the use of the Teledyne Ryan BQM-34 Firebee. During this period armed BQM-34B drones demonstrated the successful delivery of Paveway I laser guided bombs, modified shortbody GBU-8 HOBOS TV guided bombs, AGM-65 Maverick TV guided missiles, and Mk.81/Mk.82 dumb bombs. The most complex derivative was the BQM-34B pathfinder, tested under the 1974 Coronet Thor program, this vehicle carried a spherical Philco-Ford nose turret with a Low Light TV (LLTV) camera and laser designator/rangefinder package. Carried into combat by modified DC-130 Hercules transports, reconnaissance variants of the BQM-34 were used extensively during the latter part of the Vietnam conflict and achieved considerable success in photographing semi-mobile NVA SAM sites. The armed BQM-34 program collapsed with the funding drawdown following the US withdrawal from South East Asia. It was not until 1999 Allied Force campaign in Kosovo, that UAVs would be used operationally in significant numbers. By 1999 much had changed in the technology base. Low Observables or stealth technology had matured, and Moore's Law driven advances in computing power offered potential for onboard intelligence beyond the dreams of designers in the 1970s. 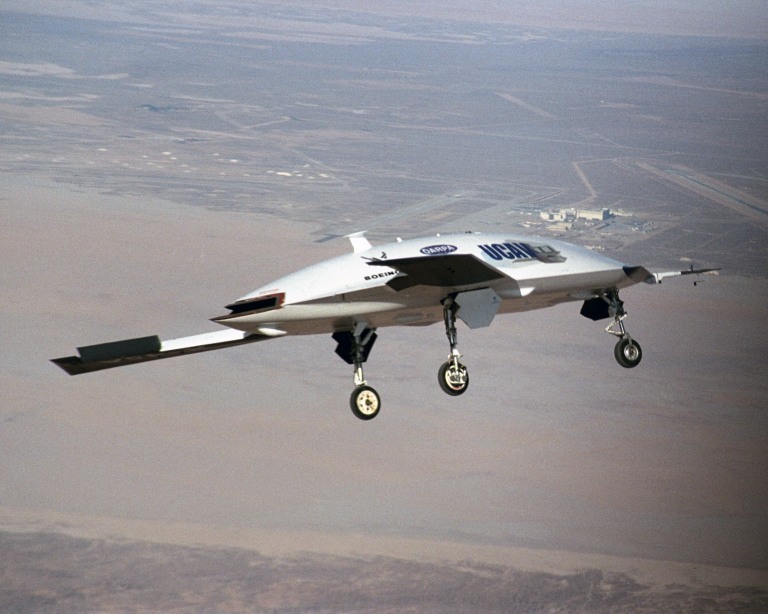 The most significant milestone in the armed UAV saga occurred during the 2001 Enduring Freedom campaign, when CIA operated General Atomics Gnat UAVs armed with laser guided Hellfire anti-armour missiles were used operationally for the first time. Using the onboard FLIR turret to locate and track high value targets of opportunity, the Gnat would designate the target with its onboard laser and engage using the Hellfire missile. A year later, a larger RQ-1A Predator operating over Yemen destroyed a 4WD vehicle carrying several prominent Al Qaeda terrorists using a Hellfire - judging from media photographs, the 4WD was carrying a lot more than warm bodies to generate the explosive effect observed! At the time of writing a number of development or demonstration programs involving UCAV technology are in full swing. The basic idea underpinning most UCAV development is that of a low cost, stealthy robotic combat aircraft capable of undertaking very high risk, or typically very high attrition, roles in which the used of manned aircraft is regarded to be problematic. The political impetus for UCAVs resides largely in the CNN Effect, as shot down aircrew are regarded to be a very high value negotiating asset by a great number of regimes which find themselves frequently at odds with the US or indeed other developed nations. Downing a combat aircraft and capturing its crew presents a tremendous propaganda coup for many regimes, especially if involved in combat with a developed nation. Given the propensity of many media organisations to generate large series of human interest stories around the missing aircrew, the issue of recovering the crew might end up rivalling the military objectives of the campaign in media coverage. In extreme cases, downed aircrew can be used very effectively as a means of exerting political pressure on the government of a Western democracy - providing fodder for domestic and foreign opponents of military actions. The conflict in Yugoslavia in many respects shaped much of the early thinking around the DARPA/US Air Force/Boeing X-45 program - a campaign environment where secure basing was relatively close, but the opponent cleverly used mobility and concealment of air defence equipment to snipe at loitering combat aircraft, especially low flying fighters. 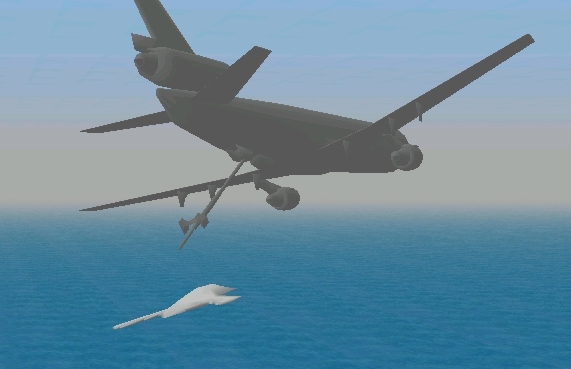 The defeat of mobile SAM and AAA systems requires loitering or persistent bombing techniques, which permit the bomber to engage as soon as the identity of a discovered target is confirmed. The dilemma is of course that loitering in contested air space invites a sniping shoot and scoot SAM shot. In turn this is reflected in the priorities seen in the DARPA/US Air Force/Boeing X-45 program - Suppression of Enemy Air Defences / Destruction of Enemy Air Defences (SEAD/DEAD) is the prime role for the vehicle, as this is the role historically where there is greatest potential for high value combat aircraft loss and aircrew capture. In the most fundamental sense a UCAV is any robot aircraft capable of delivering a weapon. An F/A-18A or F-16C retrofitted with a suitable control computer and digital datalink communications package would become a UCAV. Whether a UCAV is custom designed for a role, or produced as a derivative of an existing combat aircraft, is an implementation issue. Indeed, proposals have been floated in recent years for UCAV variants of the F-16C and JSF, intended to address the issue of aircrew exposure and very long loiter times. UCAVs do offer some compelling advantages other than avoiding aircrew exposure. A UCAV does not fatigue, and thus endurance is bounded by consumables like lubricants, weapon payloads, and availability of aerial refuelling assets. Another consideration is G tolerance - UCAV CPUs do not experience GLOC. The core technology issue in UCAVs is not the design of the airframe - in principle any airframe can be adapted. The do or die item will be the software in the UCAV's central mission computer and the digital radio datalinks which connect the central mission computer with offboard operators or mission supervisors. The software code required for a UCAV is not trivial, despite public assertions by UCAV proponents suggesting this is not an issue. For any combat aircraft to perform its role effectively, and survive in combat, it has to be controlled and managed through its sortie. In manned aircraft this function is performed by a human wetware, which provides cognitive and decisionmaking capabilities, which are enhanced by hardware/software systems for aircraft and weapons managment and control, and by a typically complex suite of sensors such as radar, warning receivers, thermal imagers etc. In a modern manned aircraft 60% or more of the total cost of the vehicle usually falls into the domain of the avionics and the software running on the avionics. This ratio may be further skewed in time with fifth gen vehicles like the F/A-22A and JSF. What more than half of the vehicle's cost amounts to are subsystems which collect, process and present information to the operator, and drive the vehicle and systems on command. In a UCAV the cognitive and decisionmaking capabilities of the pilot or crew must be replaced. One extreme, a wholly autonomous UCAV, does so with a hardware/software system, the other extreme, a wholly remote controlled UCAV, does so via radio datalinks to a remote operator in another aircraft or ground station. There is a very fundamental tradeoff in play here - more onboard intelligence reduces the demand for datalink capacity, and vice versa. UCAV proponents will often argue that existing computer technology can wholly replace the pilot in a combat aircraft - in effect, they argue that the cognitive and decisionmaking capabilities of an experienced combat pilot or WSO can be successfully emulated in software, or can be emulated in the near future. A common line of argument advanced is that Moore's Law, the exponential growth law in hardware computing power, will see to this very soon. After all, current microprocessor chips in transistor counts rival the neuron counts of small mammals - ergo a gaggle of 2020 microprocessors are likely to rival the human brain in switching element counts. Curiously enough, the enthusiastic belief that human cognitive and decionmaking capabilities will soon be emulated in computer hardware/software is not one shared widely in the computer science research community, or indeed the artificial intelligence (AI) research community. A major computer science conference in the late 1990s dealing with Moore's Law demonstrated a complete lack of consensus on whether true artificial intelligence can be produced by 2040. Empirical experience in science indicates that accurate predictions of what technology can be created usually hold only one decade out - thereafter outcomes tend to be highly unpredictable. In practical terms, replacing the autonomous capabilities of the human crew in a UCAV will require the computing technology to wholly emulate the thought processes of that human crew. UCAV lobbyists and proponents in arguing the imminent replacement of manned aircraft with UCAVs are arguing the imminent emergence of true artificial intelligence - an argument no self respecting computer scientist will touch! An interesting question which remains to be answered is whether it is wise, let alone politically viable, to deploy wholly autonomous UCAVs with true AI capabilities. Robot warriors such as James Cameron's Terminator (Universal) have tremendous popular appeal, but some very fundamental questions arise with robot killing machines - their motives are by their fundamental nature different from those of human warriors. A citizen soldier is defending his community, and ultimately his gene pool, a custom designed robot psychopath presents a whole range of ethical, legal, command and management issues which remain to be understood. In the absence of true artificial intelligence, other important issues must be resolved before UCAV technology can fulfill its full potential. Datalink capacity is a key issue. While many roles such as SEAD/DEAD or reusable cruise missile style bombardment are undemanding in bandwidth, other roles such as armed reconnaissance, loitering bombardment, and even interdiction can require up to multiple Megabytes per second - a consequence of real time video image transmission. Such throughput, especially if using satellite relays or UAV based pseudo-lite relays, is not the province of small fixed omni antennas. Typically X-band satcom uplinks require either steerable dishes of around one metre diameter, or in a stealthy vehicle an AESA (phased array) of similar size. Angular coverage for a satcom arrangement almost dictates an AESA flush mounted in the spine of the UCAV. Without onboard AI the complexity of the role will push up bandwidth demands, as a human operator becomes increasingly needed to drive the UCAV and its systems. Datalink throughput capacity is a hidden cost in any UCAV - if a US$ 5M UCAV ties up 30% of a US$250M communications satellite or several US$30M communications relay UAVs, what is the true system level cost of the UCAV package? Again, this is one issue which UCAV proponents often gloss over - the practical reality is that the cost advantages of removing combat pilots and WSOs may not stack up against the overheads required to operate a UCAV remotely. It is worth noting that an RQ-4A Global Hawk complete with sensor package and ground station rivals the cost of an F-15E fighter. Datalink resilience is another key issue. While the technology is available to make substantially jam resistent, and frequently covert, radio datalinks, the reality is that smart opponents will find ways of jamming or interfering with datalinks. A well designed datalink typically reacts to jamming by reducing its throughput, trading away its available throughput and reach to reject the jamming signal. UCAVs which are significantly dependent upon their datalinks may suffer serious impairment in capability in a heavily jammed environment. Manned aircraft in such situations are sufficiently autonomous to prosecute most missions to completion, a UCAV with limited autonomy may have to abort its mission. It is worth noting that datalink throughput and jam resistance is improved by increasing power-aperture performance (not unlike radar), which ultimately amounts to fighter like AESAs committed to carrying one and zeroes first and foremost. Aerial refuelling will be a key capability in making full use of the benefits inherent in the UCAV. Without the impediment of aircrew fatigue, a UCAV with aerial refuelling capability can remain airborne indefinitely, consumables permitting. Yet again, aerial refuelling (AAR) for UCAVs is vapourware. AFRL under US Air Force sponsorship are performing research and development in this area but we may not see working hardware for years to come. At this time two techniques are being actively explored. 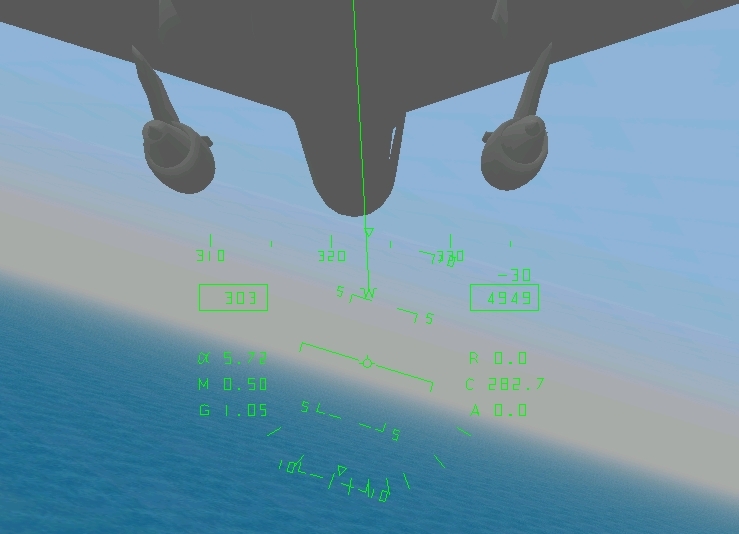 In a boom refuelling environment, a video based system in which a software system analyses tanker shape/size changes to determine relative position appears to be the preferred approach. With hose/drogue refuelling, a package of LED lights in the drogue basket is viewed by an optical sensor on the UCAV's boom, permitting precise relative position measurement. Aerial refuelling involves flight in very close relative proximity, which tends to introduce coupling effects - the control loop required for AAR must be considerably faster than a control loop for an ordinary autopilot. 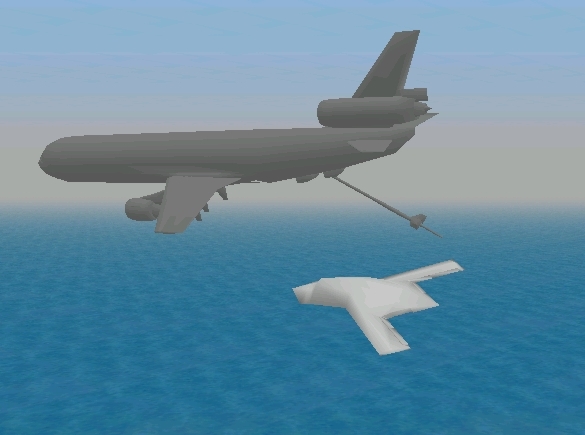 With an aerial refuelling capability, a tanker equipped for automated UCAV refuelling could tow a package of UCAVs to within several hundred nautical miles of a target, unleash the UCAVs to perform their respective missions, and then tow the UCAVs back to a runway. If the UCAVs need to loiter, a tanker could be swapped for another to ensure that adequate fuel supplies are available. The current technology base will permit the development of UCAVs with substantial levels of automation in basic functions, but with very limited autonomy in performing more complex tasks. Full autonomy in complex roles will remain unattainable until a true AI technology becomes available - and this may well be many decades away, despite the unquestioning optimism of UCAV proponents. UCAV proponents who choose to believe otherwise are staking their credibility on a technological holy grail, which like faster-than-light space travel, cold fusion and other such ideas awaits a fundamental technological or scientific breakthrough to become reality. While true AI will almost certainly appear in time, planning force structures around expectations that such a breakthrough is imminent is clearly foolish, as history repeatedly demonstrates. The UK experience with Duncan Sandys is a lesson all too frequently forgotten. 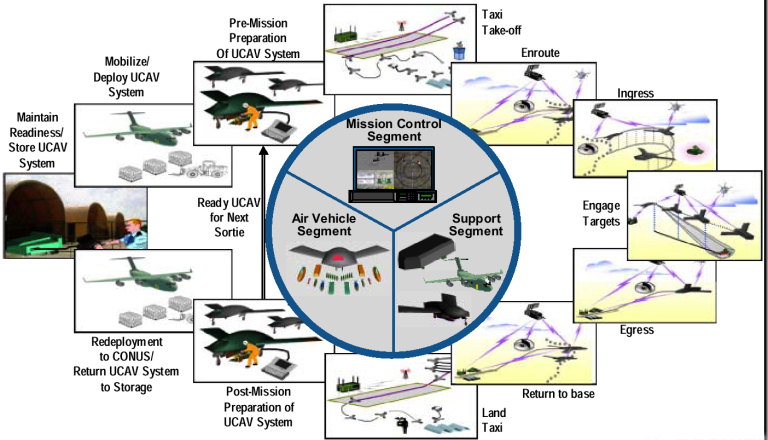 Assuming we have viable UCAV technology, even without the full autonomy provided by a true AI technology, the question arises as to which roles and missions are best performed by UCAVs, and which are best retained in the domain of manned aircraft. Roles which involve unusually high risk of aircraft loss are immediate candidates, as are roles in which unusual range or persistence is required. Reconnaissance and surveillance roles are indeed the niche which was first to be occupied by UAVs, since both of these roles incur often very high risk while persistence at range is essential for surveillance oriented work. The drawback of most existing reconnaissance and surveillance UAVs is that these are slow and unstealthy vehicles - a byproduct of the aerodynamically very efficient high aspect ratio unswept wing design needed for great endurance. The direct consequence of this is that reconnaissance and surveillance UAVs can only make use of altitude to improve survivability - a dubious advantage in an era of long range SAMs and altitude/climb record breaking interceptors like the MiG-25/31 or Su-27 series. High altitude might improve survivability and slant range, but exposes a high flying UAV to the same weather and terrain elevation related problems experienced by satellites. Cloud will blind thermal imaging and daylight television cameras very effectively, forcing the use of synthetic aperture mapping radar. The latter, despite picture resolution now in inches, is also not without its limitations, since terrain shadowing at shallow slant angles can obscure many targets. Often there is no substitute for a close in photograph or video frame. Low altitude penetration is not an option for a high latitude long endurance optimised UAV - poor gust resistance, low speed and large radar signature would all impair survivability. The Vietnam era exploits of recce equipped BQM-34 Firebees are a matter of historical record. 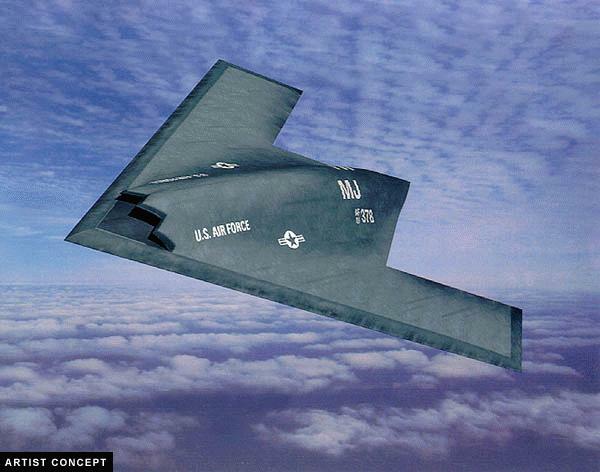 It takes little to conclude that a transonic stealthy UCAV airframe such as the X-45 series could prove to be an unusually effective low altitude reconnaissance platform - in effect a stealthy Firebee. Assuming that an automated AAR capability can be provided, then a stealthy transonic UCAV can displace many existing reconnaissance/surveillance UAVs in environments where the latter cannot survive. The additional benefit of being able to carry a small smart munitions payload for high value targets of opportunity is an added bonus. The SEAD/DEAD role is the focus of the current US Air Force sponsored demonstration program, the aim being to understand what problems arise in operating single UCAVs, and coordinated packs or swarms of UCAVs in hunting for mobile SAM systems. There is no guarantee that the UCAV will prove viable, as the challenges in coordinated operations by multiple UCAVs are not trivial. Until the program is completed, the full extent of what problems need to be solved will remain a subject for argument. High power support jamming of hostile radar systems, the Prowler/Raven role, is another environment where the UCAV might prove particularly useful. This is a role where the jamming platform is highly exposed and will attract much enemy attention, resulting in concentrated SAM and fighter attacks where the situation permits. Any aircraft pouring out tens of kiloWatts of jamming power cannot be concealed easily and is a priority target for a defending force. US industry sources suggest that the US Air Force is currently investing effort into a new generation of compact and lightweight modular internal jammers, specifically for use on the F/A-22A, possibly JSF, and most likely the UCAV when it materialises. High power jamming systems are an integration challenge, and issues will arise with putting such payloads on an aircraft which is remotely controlled over radio datalinks, many of which might operate in bands to close to those being jammed. Spillover from jammers into internal avionic systems is a well established design problem in all support jamming aircraft. A UCAV role proposed in the US has been its use as a carrier vehicle for a high power microwave (HPM) directed energy weapon intended to defeat opposing radars and computer systems. Such weapons are similar to one shot E-bombs, but generate pulsed or continuous wave microwave band pencil beams at GigaWatt power levels, aimed at target sites. At such power levels, enemy electronics can be converted into molten silicon. High power jammers present serious spillover problems, and a HPM weapon generating power levels 1,000 times or more larger than a jammer presents some very interesting engineering challenges. HPM spillover into internals systems could produce a self-kill very quickly indeed. One role which has been debated for the UCAV is that of a reusable cruise missile. Unlike a one shot cruise missile which is expended, a UCAV can drop two JDAMs or multiple Small Diameter Bombs on the target and then return for refuelling, reprogramming and reloading, to perform another sortie. This niche bombardment role is one where the limitations of a UCAV with restricted autonomous capability are less than critical. This is because the target is fixed, and with a decent radar warning system fitted, fairly simple threat avoidance algorithms can be used when penetrating to the target. The UCAV is simply programmed to select a flightpath which avoids known ie prebriefed threats, and reactively evades pop-up surprise threats. This UCAV role does not make a case for replacement of manned bombers, the UCAV provides essentially a a more survivable and reusable replacement for the more expensive longer ranging cruise missiles. As the UCAV is not expendable, some investment could be made in the aircraft's radar warning and defensive systems thus providing a major survivability improvement over a conventional cruise missile. The recently reinvented 1970s idea of using a large widebody aircraft such as a 747 or A330/A340 as a cruise missile carrier could prove to be less economic and less flexible than an equally large widebody aircraft equipped as an aerial refueller and UCAV controller platform. Such a tanker/controller aircraft could lead and refuel perhaps dozens of UCAVs, each armed with multiple JDAMs or small bombs, and provide superior firepower and flexibility to the widebody cruise missile carrier. Unlike the specialised and dedicated cruise missile carrier, a tanker/controller could simply be retasked as a tanker as required - or indeed all tankers in a fleet could be equipped for automated UCAV refuelling and UCAV control and then tasked as required for UCAV or manned combat roles. The roles where the UCAV is likely to have difficulty with in the forseeable future are those where rapid and complex cognitive and decision functions are required. Loitering bombardment against battlefield and urban targets, close air support, interdiction against targets of opportunity, and counter air roles are all instances where even a mature UCAV is likely to be challenged - these roles have a proven history of challenging even experienced combat aircrew. Where this argument inevitably leads is to a situation where an air force would use UCAVs as a supplement to manned combat aircraft, to provide the numbers required for surge situations, especially where a large number of fixed targets need to be engaged. 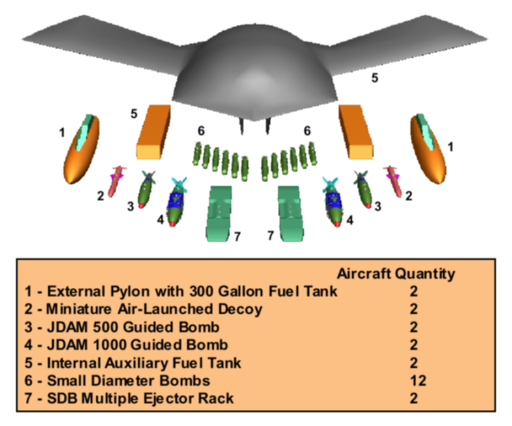 Any Cold War like standoff where a large industrialised opponent needs to be kept at bay is a situation where several hundred UCAVs tasked as reusable cruise missiles and supported by tanker/controller aircraft could provide a useful edge - any opening round of a full scale conflict would permit the use of UCAVs in saturation strikes against prebriefed targets, leaving the manned force component for more complex targets and roles. It is clear that the UCAV represents more of a long term challenge to expensive cruise missiles rather than manned combat aircraft, despite the fervent beliefs held by many UCAV proponents. UCAV proponents have for some time prognosticated the demise of manned fighters, predicting that UCAVs will displace these wholly in coming decades. Indeed, in the recent ABC TV series Air Force, a senior RAAF officer professed a belief that this would occur inside the next half century. With all due respect to Canberra's UCAV proponents, there is no scientific evidence to support this belief - it is at best wild speculation and at worst wishful thinking. One issue which seems to pervade the ongoing UCAV debate is a lack of scientific and logical rigour on the part of many UCAV proponents. Clearly UCAVs have the potential to become very useful tools for a wide range of roles and missions, especially those where cognitive and reasoning functions are of less importance than persistence or sheer numbers for saturation attacks. Reserving manned combat aircraft for roles which demand high levels of autonomy and the complex reasoning capabilities of human wetware, and dedicating UCAVs to roles where very high risk is combined with simple tasks, represents a far more rational approach to integrating UCAVs into force structures. Current US developments align closely with this model. The ultimate conclusion is that manned combat aircraft will remain with us for the forseeable future. UCAV aerial refuelling will be pivotal for roles where range and/or persistence are essential. At the time of writing US Air Force AFRL are actively pursuing a research and development effort intended to provide an AAR capability for US Air Force UCAVs. Key issues for aerial refuelling remain to be solved - autopilot and flight control loop performance must be significantly faster than what is required for conventional flight, while the limited control authority in a stealthy tailless vehicle presents problems in its own right (Bihlre Applied Research, Boeing). 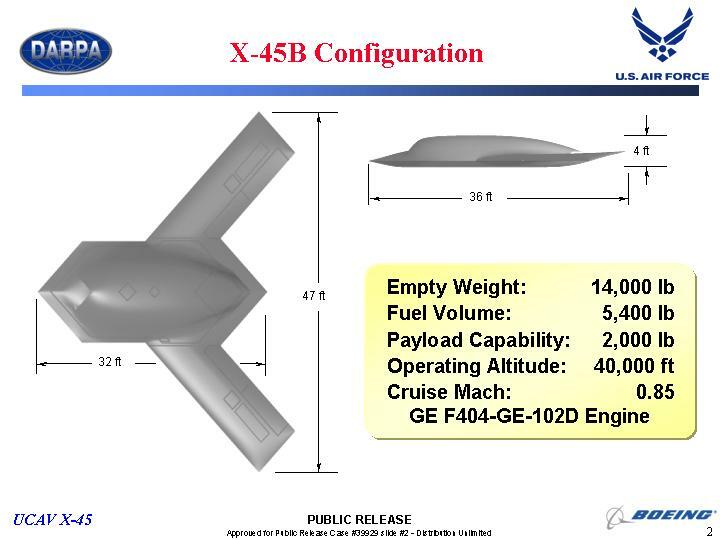 The centrepiece of the current US Air Force effort in UCAV development is the DARPA/US Air Force sponsored Boeing X-45 Advanced Technology Demonstration program. 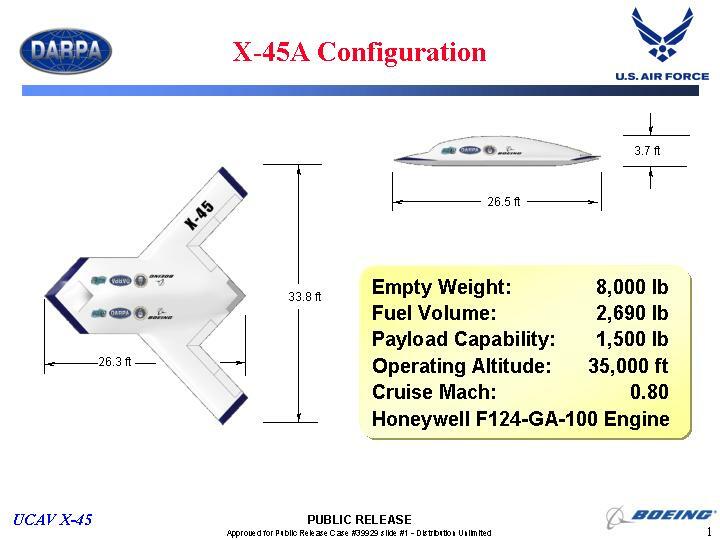 The smaller X-45A is a proof of concept vehicle, the larger X-45B is intended to provide the basis for an operational vehicle design. The X-45 draws extensively on Boeing's experience with the recently unveiled and previously classified Bird of Prey demonstrator. Key aims of the X-45 effort include a unit cost around 30% of a JSF, a life cycle cost reduction of 50-80% compared to a current tactical aircraft and global deployability. 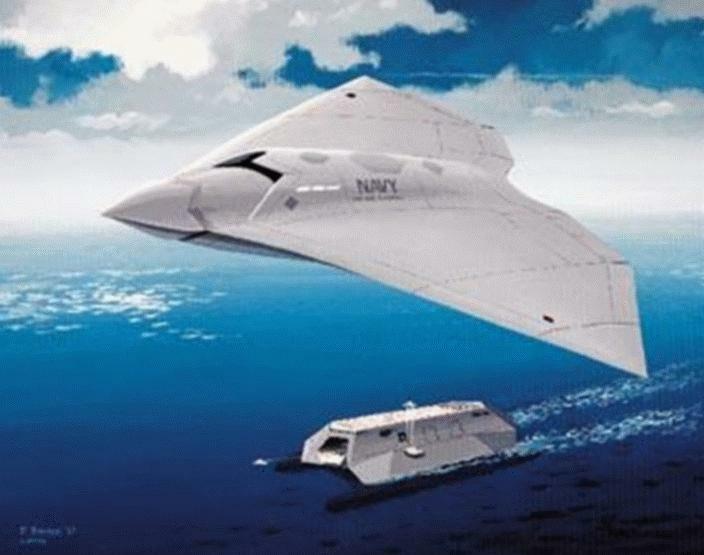 The formal DARPA/TTO 1998 System Capability Document specifies the UCAV will penetrate enemy air defenses and provide preemptive and reactive SEAD and prosecute non-hardened high value targets within the adversarys infrastructure' (DARPA). Boeing's X-45A demonstrator is now in the process of flight testing, intended to prove vehicle aerodynamics and systems. Once this effort is completed, the program will to demonstrating the vehicles' viability in the high risk SEAD/DEAD role (Boeing). These early Lockheed-Martin (left) and Northrop-Grumman (right) UCAV proposals demonstrate their heritage. 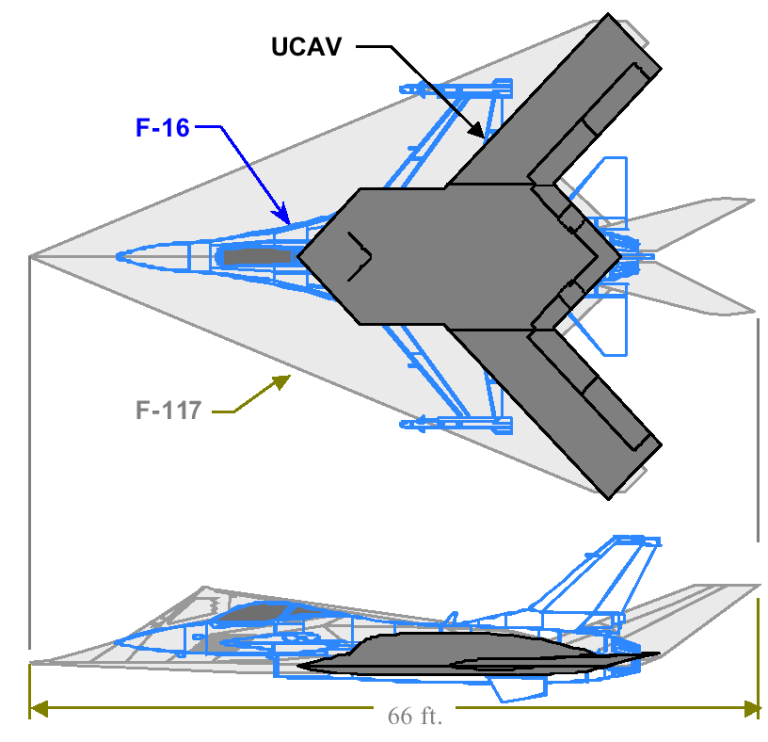 The LM naval UCAV uses F/A-22 derived stealth design rules, whereas the NG land based UCAV makes use of B-2A design rules. Of interest is the diamond shaped dorsal AESA satellite communications link on the LM design. The US Navy Joint Vision 2010 document envisages the use of UCAVs for a range of roles, with SEAD and fixed target strike prominent (LM, NG). Size comparison of X-45, F-16C and F-117A (DARPA). Stores loading options for X-45 (DARPA). X-45 Concept of Operations (DARPA).